After our recent discussions about brand activation, I couldn’t help but think about Glossier, an emerging beauty brand that is taking the digital space by storm, and their recent brand activation through showroom pop-up shops. Like many other brands born in the digital age, Glossier got its start through social media. It’s founder, a beauty-blogger-turned-entrepreneur, has an innate understanding of the power of social media in the beauty community. Everything about Glossier, down to the individual product packaging, is carefully crafted to look as if it belongs in an Instagram post. This perfectly curated image and digital presence has led to immense growth of the brand, and encouraged it’s marketing team to stretch it’s efforts beyond the digital sphere and into the physical one. 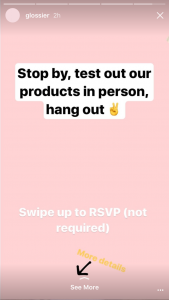 In the past couple of weeks, a mini Glossier showroom has popped up in Portland and Los Angeles, promoted through the Glossier social channels a few days in advance. A close look at each showroom proves Glossier sticks to the “why” reasoning that the brand was founded on: maintaining a brand that belongs on social media. 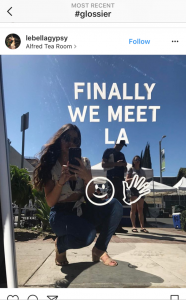 Large mirrors branded with phrases like “you look good” and “finally we meet LA” and carefully curated product displays are placed throughout the location, subtly encouraging brand fans to post and share photos on social media…and they did. 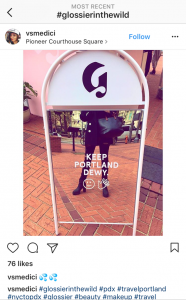 Even without any supporting sales data, it’s clear that Glossier’s pop-ups are fostering major brand engagement, evident through the flood of posts on the #glossier and #glossierinthewild hashtags. Every aspect of Glossier’s marketing; from its edgy-yet-feminine social media presence to its on-brand pop-up space decor, work in harmony and complement one another, resulting in an ever-growing customer base that is proud to represent the brand.